Obviously people know by now that Queen's masterpiece (proclaimed by tons of fans) was A Night at the Opera. Fusing so many genres into one classic prog rock mixing pot and doing so well at it was just a stroke of genius. Of course then, Queen had to devise a proper follow-up to the record. Sadly, A Day at the Races did not live up to that name... In fact, it didn't even come very close. It was a bit too streamlined and poppy for many people's standards. 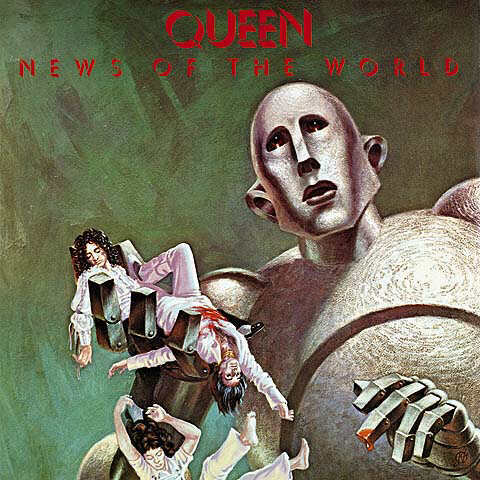 However, with Queen's second chance, they recorded News of the World, one that would change their career. It's not to say that News of the World is better than A Night at the Opera, but its explosion of genres definitely puts Queen at their prime once again like they were in that album. Sure, some songs don't exactly work, like the Latin rhythms of "Who Needs You" or the bland hard rock of Roger Taylor's "Fight from the Inside," but when things do work here, they are an absolute triumph. The most popular and most recognizable songs are the two first ones, "We Will Rock You" and "We Are the Champions." The former starts off with a very popular stomping beat combined with A capella vocals, before ending with a nice solo from Brian May. The latter focuses more on Freddie Mercury, whose piano and vocals are the forefront of the piece. It's chorus is very inspiring and bombastic. The other songs on this album are quite interesting. My personal favorite on the album is "All Dead, All Dead," which has Brian May doing both vocals and piano work. The poetry that permeates the song is absolutely beautiful, as is the elegant piano. However, the three songs mentioned are not even close to the end of how many styles are present here. "Spread your Wings" is another amazing piece, and probably the best of Deacon's works. This time Freddie takes the lead vocals, and definitely excels in doing so. The heavier moments that offer a contrast are here as well. "Sheer Heart Attack," Queen's answer to punk rock (as well as an attack on it), is extremely heavy for the time it was released, and Freddie has more aggressive vocals to this one. However, traces of glam can also be heard in the chorus, almost reminiscent of Sweet. Also, the song "It's Late" has the best (and some of the heaviest) fret work in the album. Freddie might be doing vocals, but Brian May is the star of the show on this one. As for flaws on the album, there are few. However, two songs make you wonder just what Queen was trying to do. Those happen to be "Fight from the Inside" and "Who Needs You." The former is another average hard rock song from Roger Taylor. Instead of being energertic, though, it decides to be a bland, low-riding rocker that just goes on for too long, and it's simply directionless. The latter is an annoying Latin piece by Deacon that gets very boring, and it just doesn't fit well with the other styles present. The flaws aren't too destructive to the album, however, and News of the World is still a triumph for Queen. Too band they never went back to it after Jazz.